- The driver’s seat belt is fastened. - The driver’s door and engine hood are closed. - The brake vaccum pressure is adequate. - The battery is sufficiently charged. - The outside temperature is more than 28.4°F (-2°C). - The outside temperature is under 89.6°F (32°C). - The engine coolant temperature is not low. If the ISG system does not meet the operation condition, the ISG system is deactivated. 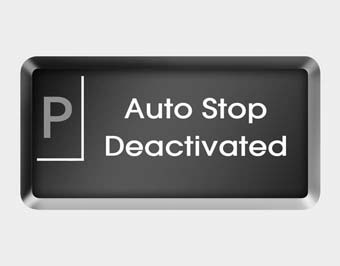 The light on the ISG OFF button will illuminate and a message “Auto Stop Deactivated” will appear on the LCD display (if equipped). If the light or notice comes on continuously, please check the operation condition.